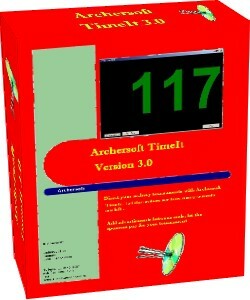 Archersoft TimeIt is a program developed for the shooting director of archery tournaments. The program times the shooting, and shows not only Red, Green and Yellow colours, it shows the actual time left. The shooting director directs the shooting from a pc, the image from the pc is sent to ordinary tv-sets, where they are visible to the archers. From the soundcard in the pc, the sound is also generated with one, two or three beeps. A CD-ROM in the pc enables playing music whilst the archers score their arrows (Please note, that in some countries royalties must be paid to the music business, when doing this). As the system sends the time to tv-sets, this product is best used at indoor archery tournaments. The program also allows advertisments to be shown on screen when the archers score their arrows. It is possible to put several commercial advertisments in the system as to switch between different advertisments. Thus making it possible for each club to earn money on this feature. Language support: The program supports different languages, simply (re)place the "TimeIt.lng" file in the same directory as the executable. The language file can be edited with a simple texteditor (like Notepad). Currently only an english version of the language file is available, but I encourage translators from different countries to send their translation to Archersoft. It will then be available for download from this site. Download the file and unzip it to Timeit.lng, place the renamed file in the same directory as your TimeIt.exe resides. ScoreIt Pro is the next step in competitions. ScoreIt Pro is for setting up a competition, inputting all archers names, entering the archers points, sorting, and printing out the resultlists. ScoreIt Pro costs only DKK 1000.00 (1000 danish kroner or €140.00 Euro), download the newest version in the table below. scoreit_database.zip WI-V1.0.3.972 3 MB This is the database, that will save all the entered information. This is obligatory. indoorfita.zip 1.0.0.1 < 1 MB Indoor Fita. outdoorfita.zip 1.0.0.1 < 1 MB Outdoor Fita. olround.zip 1.0.0.0 < 1 MB Olympic Fita. usermanualscoreitprouk.zip 1.0.0.0 < 1 MB Usermanual for the system. It is highly recomended to read the installation manual, PRIOR to installing.